Multidisciplinary methods have also been successful. Huang and colleagues combined protein–protein interaction networks with CMap to identify 11 potential drugs to treat non-small cell lung cancer, five of which inhibited cancer cell growth in vitro (23). In addition, Lan and colleagues applied machine-learning strategies to complement systems biology data to enrich for true positives; the authors identified 87 potential therapies for nasopharyngeal carcinoma, where over half had been previously described as having anticancer properties (26, 27). These examples underscore the importance of validation to continually improve computational algorithms with empirical evidence. While in silico successes have been highlighted, not all candidates go on to be validated. Potential challenges include would-be true positive hits initially scoring low and being discarded. Encouragingly, since many compounds act as pro-drugs and must be activated in vivo [e.g., tamoxifen (28)], it is plausible that certain anticancer agents could fail in vitro, while in silico analysis of active metabolites would correctly identify efficacy. Thus, given its relative low cost to other methods, and effectiveness in identifying strong therapeutic candidates, in silico technologies are highly suited for repurposing initiatives that could potentially yield novel FDA- and EMA-approved medicines. Most opportunities aimed at producing affordably priced drugs for orphan diseases mainly reside in drug repurposing (43). However, there is also potential for the opposite, such that drug companies usually price these therapies at a substantially greater value than a middle-class individual could afford, and insurance companies typically cover only a portion of the cost of treatments for such rare diseases (44). In addition, several controversies exist regarding motives behind drug repurposing endeavors. For example, affordable medicines can become unaffordable once a company discovers that it can be used to treat a less common indication; this type of “price gouging,” where prices of inexpensive products skyrocket seemingly overnight under conditions of corporate monopoly, does not benefit patients with such unmet medical needs (43, 45). Accordingly, lawmakers are currently determining how to prevent such events from becoming standard practice (45). Further, it is predicted that by 2020, a fifth of drug sales will come from orphan disease treatments including those for various cancers,27 representing a partial shift away from common illnesses such as diabetes, asthma or cardiovascular diseases, and therefore, a balance between price and profit must be achieved to maintain drug affordability for both patients and drug makers alike (8). 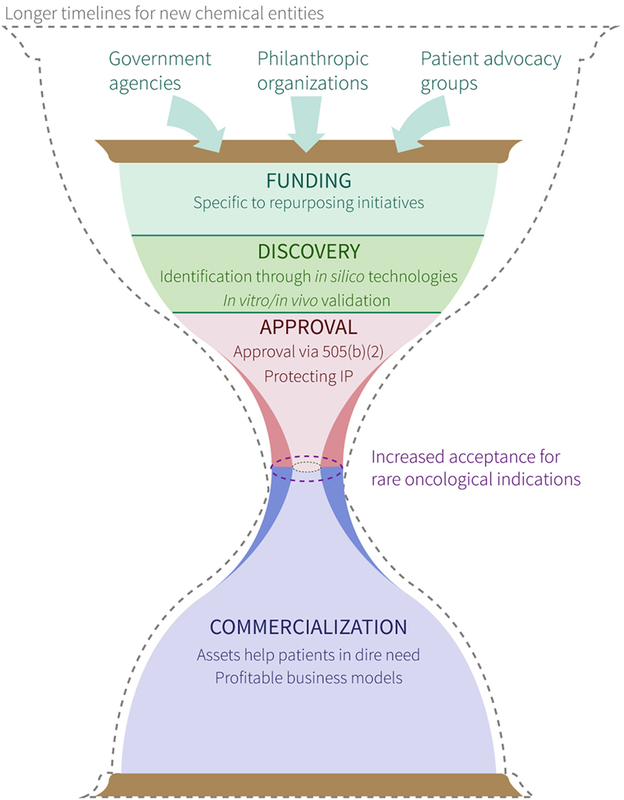 By incentivizing drug makers to invest years and billions of dollars into drug development for rare and orphan diseases via various mechanisms (e.g., subsidies, tax credits, and fast-tracked drug approval), patients with rare conditions benefit as they can expect less expensive medicines than if such incentives were not in place. ^“Treatment for Endogenous Cushing’s Syndrome”: https://clinicaltrials.gov/ct2/show/NCT01838551 [last accessed June 15, 2017]. ^“Funding and Notices”: https://ncats.nih.gov/funding [last accessed June 11, 2017]. 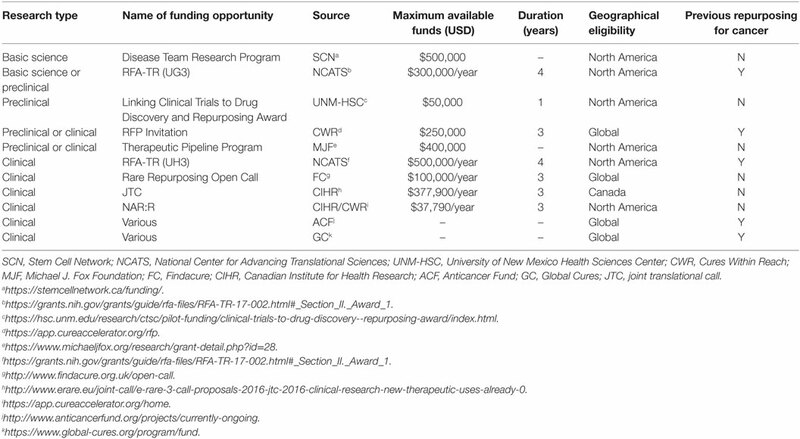 ^“Rare Diseases Drug Repurposing Funding Opportunities”: http://www.cihr-irsc.gc.ca/e/49739.html [last accessed June 10, 2017]. ^“Research in Progress”: http://www.cureswithinreach.org/research/search-complete-research/research-projects [last accessed June 11, 2017]. ^“Projects”: http://www.anticancerfund.org/projects/currently-ongoing [last accessed June 12, 2017]. ^21 U.S.C. § 355 and § 360cc. ^“An increasing number of companies are using a once-obscure FDA drug approval pathway”: Regulatory Focus, http://www.raps.org/Regulatory-Focus/News/2015/04/08/21933/An-Increasing-Number-of-Companies-Are-Using-a-Once-Obscure-FDA-Drug-Approval-Pathway/ [last accessed June 16, 2017]. ^“Guidance for Industry: Applications Covered by Section 505(b)(2)”: United States Department of Health and Human Services, Center for Drug Evaluation and Research, https://www.fda.gov/downloads/Drugs/Guidances/ucm079345.pdf [last accessed June 19, 2017]. ^Article 10 of Directive 2001/83/EC as amended. ^Barratt M, Frail D, editors. Drug Repositioning: Bringing New Life to Shelved Assets and Existing Drugs. Hoboken: John Wiley & Sons (2012). ^Ellery T, Hansen N. Pharmaceutical Lifecycle Management: Making the Most of Each and Every Brand. Hoboken: John Wiley & Sons (2012). ^21 CFR § 60 (1984). ^“Patents and Exclusivity”: FDA/CDER SBIA Chronicles, https://www.fda.gov/downloads/drugs/developmentapprovalprocess/smallbusinessassistance/ucm447307.pdf [last accessed June 19, 2017]. ^21 C.F.R. § 314.108 (1999). ^21 C.F.R. § 316 (1992). ^Article 8(1) of Regulation EC/141/2000. ^Article 37 of Regulation EC/1901/2006. ^Dewan SS. Global Markets for Drug Repurposing (2016). Retrieved from https://www.bccresearch.com/market-research/pharmaceuticals/drug-repurposing-markets-report-phm175a.html. ^https://clinicaltrials.gov/ct2/show/NCT00045591 [last accessed June 28, 2017]. ^42 U.S.C. § 201 and § 283h. ^21 C.F.R. § 316.21 (2012). ^“EvaluatePharma Orphan Drug Report 2017”: http://info.evaluategroup.com/rs/607-YGS-364/images/EPOD17.pdf [last accessed May 24, 2017]. ^“Collaborations”: https://www.biovista.com/about/collaborations/ [last accessed June 27, 2017]. ^“New Indications Discovery Collaboration”: http://numedii.com/numedii-announces-new-indications-discovery-collaboration-with-astellas/ [last accessed June 27, 2017]. 34. Lu Y, Penrod JR, Sood N, Woody S, Phillipson T. Dynamic cost-effectiveness of oncology drugs. Am J Manag Car (2012) 11(Suppl):S249–56. 35. Berger J, Dunn JD, Johnson MM, Karst KR, Shear WC. How drug life-cycle management patent strategies may impact formulary management. Am J Manag Care (2017) 22(16):S487–95. 36. Stuart M. Sosei’s drug re-profiling strategy: a three-way street. Start-Up (2003) 21:6. 44. Handfield R, Feldstein J. Insurance companies’ perspectives on the orphan drug pipeline. Am Health Drug Benefits (2013) 6(9):589–98. Copyright: © 2017 Hernandez, Pryszlak, Smith, Yanchus, Kurji, Shahani and Molinski. This is an open-access article distributed under the terms of the Creative Commons Attribution License (CC BY). The use, distribution or reproduction in other forums is permitted, provided the original author(s) or licensor are credited and that the original publication in this journal is cited, in accordance with accepted academic practice. No use, distribution or reproduction is permitted which does not comply with these terms.